I like to buy garden art and ornaments from local artists. The works are often different from those you see in stores, and it’s more meaningful when you know where a piece comes from and who created it. In the past, I’ve bought a metal trellis from Jennifer Wolcott and two local gentlemen designed and assembled the pergola in my backyard. 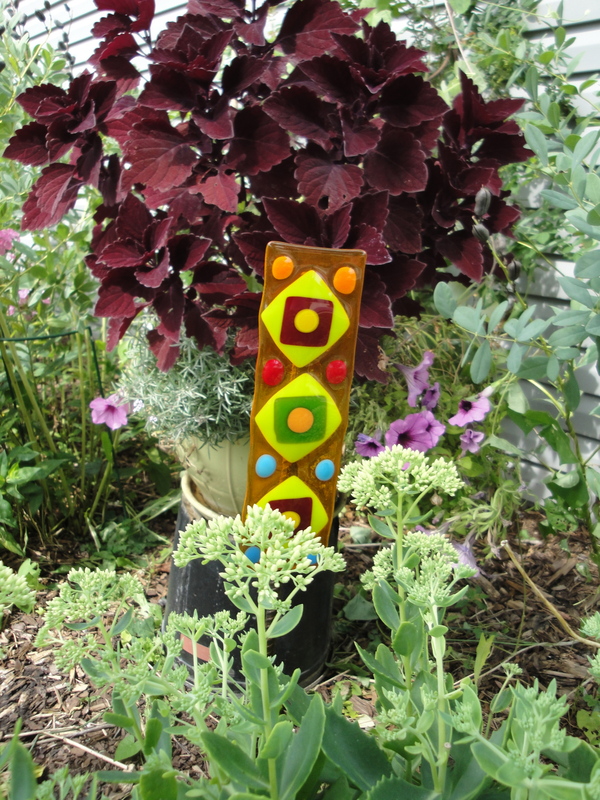 A couple of weeks ago, I bought two glass garden stakes from Geralyn Thelen, who shows her work at the Northfield Riverwalk Market Fair on Saturdays. I’ve long admired the bright colors and luminous texture of Gerie’s jewelry, home decor and furniture. So when she created these stakes for the garden, I had to have one — or two. 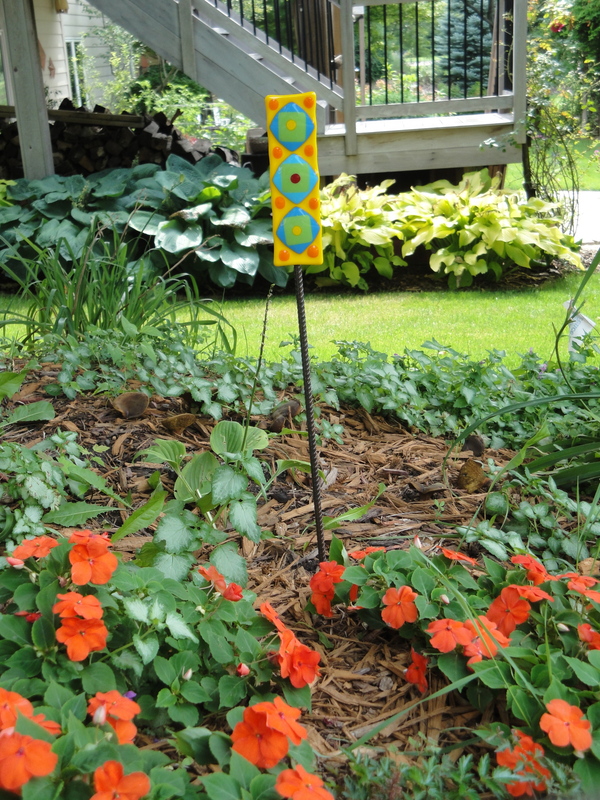 I picked two slightly different stakes in colors that work well together and with my plants and house. Being design-challenged, it took a bit of moving around to figure out how to place them well. I thought they would be a bright spot and focal point in my front door garden. So I put a stake with bright oranges and maroons behind this Autumn Joy sedum and in front of a dark maroon coleus I’m growing on trial this summer. (Fantastic plant, by the way, but more on that in a later post.) I like the surprise of the art between the plants, but in some ways the piece seems lost. To try a different approach, I put the second one in a back bed near some orange impatiens and lamium under an ash tree. Because the plants are short, this stake seems to stand out more. The plants behind it are mostly done blooming, so the artwork becomes a slightly taller focal point in the bed. Placing artwork and other structural elements in a bed takes some trial and error. In the September/October issue of Northern Gardener (which will be on newsstands soon), columnist Don Engebretson offers insights into why and how to place fountains, benches, arbors, sculpture and other nonplant elements. One of his main points is to put the objects in a bed — rather than sitting them out in the lawn by themselves. In writing this post, I noticed Gerie has a photo of the stakes in a group of three. Might be another reason for a trip to the market! What are some of your favorite ways to display art in the garden? I keep thinking I’d like to have art in my garden, and I do admire it in some of the beautiful local gardens I’ve visited, but I just get too timid. I’ll try harder to get brave.